This is a very important day in the District calendar and a great opportunity for all Rotarians to come together to network, gain increased knowledge and discover new ideas for the benefit of their Club. From new Rotarians through to the most experienced Treasurer there is something for all. The programme is very comprehensive and is listed below. You will see there are a number of extremely useful morning sessions and also the very informative and interactive Grants Fair. The House of Friendship will be the ideal location to meet old friends and find new ones – a variety of stalls to visit, tea/coffee available at £1.00 and at lunch-time (12.30 - 1.30) buy ready-made sandwich platters. I can advise that there are still spaces if your Club or a linked charity would like a free stall in the House of Friendship. .
Then, in the main theatre, at 1.30 pm DGE Olive will welcome everyone at the formal plenary session with “Rotary Serving Humanity” and information about marking the Rotary Foundation Centenary before District Officers and Chairs lead everyone to the various afternoon sessions as detailed in the programme. Remember, there are, for most roles, two sessions so you have the opportunity to cover two different topics and gain double the benefits. DGE Olive looks forward to seeing you at Inveralmond Community High School, Willowbank, Ladywell, Livingston EH54 6HW for a great Rotary day. 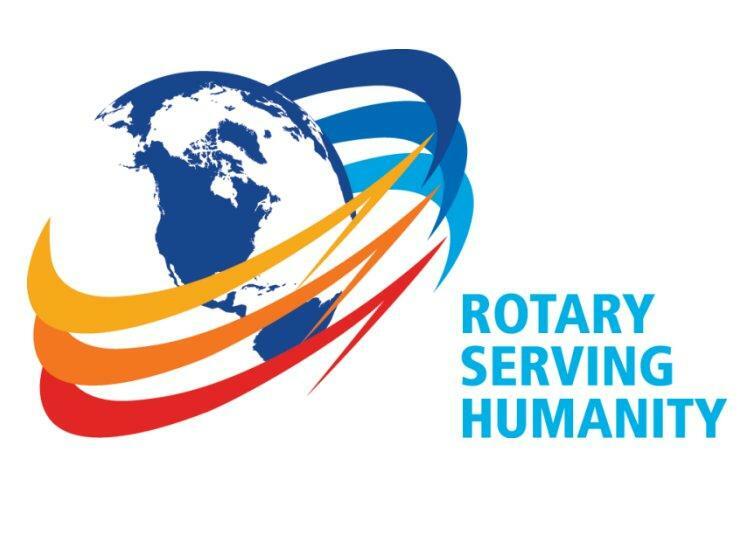 where she will outline her programme and priorities for the year and will promote “Rotary Serving Humanity” and The Rotary Foundation centenary plans. There is no final plenary session. DG Andy will be hosting this session with current Presidents to review progress, developments and highlight successes Clubs have achieved during the year. Membership Chair Duncan will be hosting two sessions on how he and his team can support Clubs to retain and recruit members with new and innovative ideas. Marketing, PR & Comms Chair Peter will lead two sessions to help Clubs raise the profile and image of Rotary and to explore a variety of useful media to do so. International Chair Frank will host two sessions to see how Clubs would like to be supported with their International activities and projects in the coming year. Comm Voc Chair Elaine and her Team will be running two sessions focused on supporting Clubs with their existing activities and encouraging collaborations across the District. Youth Services Chair will be running two seminars featuring a wide variety of activities designed to help Clubs be involved with young people of all ages in their local community. Secretary Thom will run one session featuring a wide range of administrative and policy matters.